Dark Brown hair Green Eyes- Colorful New Look Help! This cut definately. But colors? 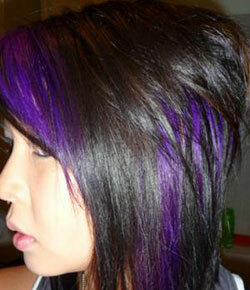 Or this coloring with the other cut? I have fair skin somewhat naturally tanned, shoulder length dark brown hair and green/blue eyes. I want a new look something artistic and bold and colorful. I thought about something like the picture I have posted - Any ideas? Answers and Comments for Dark Brown hair Green Eyes- Colorful New Look Help! I'm really interested in this full color hair style it looks awesome, is there away you can post more? It's hard to say without seeing a picture of you. Whatever you do, make sure the stylist you go to pulls out swatches to help you determine what colors you want. Make sure the color that you put closest to your face looks good on your skin. The best marker is the underside of your forearm. It is the best spot to get the true undertones of your skin. If you turn your forearm over where the underside is up, hold swatches up to your arm, It will bring out your true undertones and you can immediately tell what will accentuate unflattering tones in your skin and which ones will bring out flattering tones.